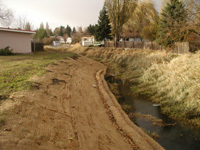 The construction phase of the project was completed September 23, 2003, Dale Stubbs excavated the existing bank to create a 2:1 slope. Slope construction took approximately six hours using a 48 inch toothed bucket. Bio-logs were installed at the toe of slope to provide a shelf for plant material and bank stabilization. The coir logs were terraced two high on the upstream section of the project. This technique was used to minimize undercutting in an area of high velocity. The re-sloped bank was promptly seeded with native grasses (tufted Hairgrass, Ticklegrass, Fowl Bluegrass, Western Managrass, Prairie Junegrass, and Idaho Fescue), herbaceous plants (Small fruited Bulrush, Common Rush, Creeping Spikerush) and native woody species (red Osier Dogwood, Sandbar and Mackenzie Willow (plugs), Quaking Aspen, Douglas Hawthorn, Nootka rose, Serviceberry, Shiny leaf spirea, and Syringa). Blue tubes have not yet been placed around the shrubs and trees. 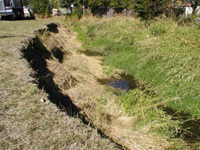 The stream segment had near vertical, slumping, eroding streambanks that contribute to the sediment load in the creek. Reed canary grass is the predominant species present on this stretch of creek. There is a lack of existing native woody vegetation close to the creek to help shade out weeds and decrease water temperature. In the past, Paradise Creek was dredged in this reach multiple times, which exacerbates the presence of vertical banks and promotes incising. Project Area Before: This is a picture of the project site before work began. Notice the slumping banks on the left.